What is Rosetta Stone Portuguese (Brazil) Online Subscription? Rosetta Stone is a top language learning provider which now additionally delivers its Portuguese (Brazil) course over the Web. 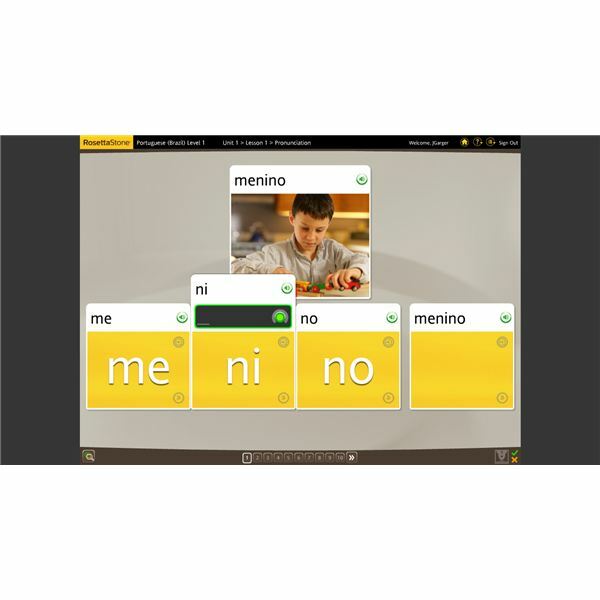 The Rosetta Stone Portuguese (Brazil) online subscription teaches you as much language content as the CDs, and has a number of advantages over the boxed version such as instant availability, a smaller price tag, and the absence of lengthy installations. All you need to subscribe to the Rosetta Stone Portuguese (Brazil) online course is your computer’s Web browser, audio input and output devices, preferably a headset, and a small piece of speech recognition software which is downloaded from the vendor’s web site. The language learning solution teaches you Portuguese using immersion, which is Portuguese in Portuguese, without formal grammar. Three levels of Brazilian Portuguese take you from the basic level to intermediate skills by means of reading, speaking, listening and writing activities. Each level of Portuguese (Brazil) contains four units which are divided into four lessons. A lesson starts with a core lesson, followed by a number of activities and exercises to help retain what you have learned and to introduce new words and phrases in every-day situations. A method called adaptive recall brings up repetition exercises depending on your performance, and you will conclude each Portuguese (Brazil) lesson by practicing your skills in a real life scenario. A lesson’s total duration is about the length of a book’s chapter, yet you can always sit and do an exercise when you have about fifteen minutes of spare time and access to a computer with an Internet connection, such as during a lunch break at work perhaps. Portuguese is likely to be difficult for English speakers without knowledge of a Latin language, yet the Rosetta Stone online learning solution makes it easy for everybody to start learning, and you will be rewarded with competency in one of the most beautiful languages on the world – Brazilian Portuguese. Please find all details regarding the three levels of the Rosetta Stone online language learning solution on the next page; the rated sections Outcome, Tips & Tricks as well as Price to Value are located on page three of this review. The first level of the Portuguese (Brazil) language learning solution features the topics: language basics, greetings and introductions, work and school as well as shopping. In a typical exercise of the first unit you are being taught A menina está comendo (The girl is eating), and to help you started with the Brazilian language you practice syllable pronunciation, e.g. me-ni-no, menino (boy). In the second unit’s activities you start asking basic questions like Qual e seu nome? (What is your name?). A good example of the work and school topic of unit three is Onde você trabalha? (Where do you work? ); be assured that Rosetta Stone activities are neither boring nor overly simple. If you don’t pay attention to the imagery which is giving you leads for answering an exercise correctly you may make a wrong association and see a red cross instead of a green tick. After the fourth unit of level one you will be able to make comparisons such as A bicicleta roxa custa menos que a bicicleta amarela (The purple bicycle is cheaper than the yellow bicycle). In level 2 of the Rosetta Stone Portuguese (Brazil) online subscription you acquire new language skills in the topics: travel, past and future, friends and social life as well as dining and vacation. You will be taught to ask question like Aonde eles vão? (Where do they go? ), or, in the second unit, O que vocês estudaram ontem? (What did you study yesterday?). The following sample taken from a dialog in the 3rd unit is very useful in Brazil: Os músicos estão tocando no restaurante (The musicians are playing in the restaurant), and the same is true for A mulher está comendo frango no almoço (The woman is eating chicken for lunch) found in unit four, because the Brazilians love music, and eating chicken in Brazil is as common as eating hamburgers in the United States. However, please note that the Rosetta Stone Portuguese (Brazil) online subscription does not teach any cultural behavior or habits, or information on topics like Samba and Carnival. All depictions of places and faces are a mix from all over the world along with a universal set of phrases and neutral vocabulary in a conversational language style. Level 3 of the language learning solution teaches you Portuguese (Brazil) in the four units home and health, life and world, everyday things as well as places and events. In activities including, but not limited to, multiple choice and drag and drop exercises you learn phrases like O gato está no sofá e a mulher esta ao lado do sofá (The cat is sitting on the sofa and the woman is beside the sofa), or, in unit two, Vai chover daqui a pouco? (Will it be raining soon?). Being able to ask about the weather can be important in Brazil, where, if the sun doesn’t shine, it may rain heavily and you may not be able to travel by coach – the number one means of transport. Se eu tiver dinheiro suficiente, comprarei isto (If I had enough money I would buy it) has been taken from unit three to demonstrate that once you have reached that point in the Portuguese course you will be able to make such conditional clauses automatically without thinking. Last but not least you will learn about making arrangements for accommodation and travel, exemplified by Eu gostaria de fazer uma reserva (I would like to make a reservation) toward the end of the course in the unit places and events. The milestone number five in the fourth unit of level 3 concludes the Rosetta Stone Portuguese (Brazil) online course in a scenario featuring a couple going for a walk and talking to people. I first learned Portuguese (Brazil) many years ago, but, for lack of practice, forgot most of what I had learned in the late 80’s until I moved to Brazil in 2008. The Rosetta Stone software has been helpful to me for regaining an intermediate degree of fluency faster than if I had studied all the grammar books on their own. So while I am already immersed where I live the Rosetta Stone Portuguese language learning solution has done a real good job in improving my pronunciation, and opened my mind to be more receptive to the Brazilian language in general. The speakers of the language course seem to have an accent (sotaque) of the North-Eastern region where I live; I just mention it because I find it more beautiful compared to, for instance, how people in Rio de Janeiro or Sao Paulo speak, and, in fact, Brazilian Portuguese with a North-Eastern accent will even be easier to learn, in my opinion. The Rosetta Portuguese (Brazil) online language solution has no prerequisites and teaches you the language right from scratch, and you will have intermediate language skills at the time you complete the course. Then you may want to solidify and extend your grammar and vocabulary by traditional means of learning, as the Rosetta Stone Portuguese online language course does hardly teach you much more than a year of language study in a class. Whereas traditional languages courses are sometimes a bit academic, the Rosetta Stone course teaches you what you need to know in day-to-day life, which is particularly useful if you visit a Portuguese speaking country for holidays or a business trip. BTW: Besides Portugal and Brazil, Portuguese is an official language in Angola, Mozambique, Cape Verde, Guinea-Bissau, São Tomé and Príncipe as well as East Timor, and is additionally spoken in China’s Macau Special Administrative Region. The Rosetta Stone immersion method does not include any preparation material, but you can access a script of the dialogs form the help menu and use the downloaded pdf file as a vocabulary trainer if you want. Additionally, you may navigate to Rosetta Stone’s website to check out the vendor’s language learning tips or to obtain their Audio Companion CD’s to listen to magnificent Portuguese while driving, for instance. All learners who feel they cannot learn Portuguese unless they have studied the alphabet may be happy to hear that it can be found in help as well, naturally as a listen-speak exercise. Yet, please note that Brazil has completed its Portuguese alphabet with the letters “K“, “W” and “Y” at the beginning of 2009, something which the Rosetta Stone online language learning solution does not yet reflect. Read about this in Bright Hub’s article Portuguese Orthography Reform: A Benefit for Students and Businesses Alike. The three month subscription to the Rosetta Stone Portuguese (Brazil) online language learning solution costs $199, but the better deal might be subscribing for 6 months at the price of $299.95 to have sufficient time to complete all three levels of Portuguese. Based on the six month subscription rate, the online course is much more economical than the CD bundle, including Audio Companion. In either online subscription you get a headset for free. Rosetta Stone Portuguese (Brazil) online is an excellent tool for beginning your study of the language in the convenience of your home or even in your easy chair if you have a laptop. While it will not take you too much further than a year of academic study, the advantages of choosing when to study are obvious. The online version even allows you to sign onto Rosetta Stone's website in your lunch break and complete a fifteen minute session. Rosetta Stone also keeps all of the statistics of how well you learn different aspects of the language, and sets up a schedule based on your mastery to keep what you have learned fresh and to refresh sections where you had difficulties. You have the option of printing out learning material to aid the learning process, and instant access to the course through the Internet. However, if you are a slow but steady learner, you should consider the somewhat more expensive option of purchasing the CDs, so you can learn at the pace best suited to you. That option does also let you keep the CDs on hand for whenever you want to brush up on some element of the language- whereas once your online subscription is finished, your learning tools are gone as well. Online or on CD, the courses are identical. Bright Hub heartily endorses the Rosetta Stone Portuguese (Brazil) course in both formats.